Black Perspex, originally uploaded by danny angus. The office was a frenzy of excitement yesterday because the black perspex was delivered for the photography. 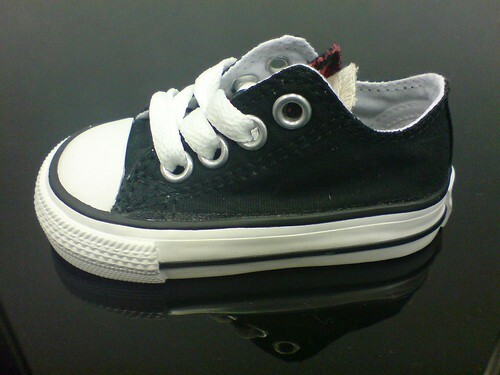 So I took this picture of a baby's Converse Allstars on it with my phone. Nice? I think so. Imagine what we can do with an actual camera. One of the first things I did when I started here in November was to introduce Jira, prior to that we lacked a certain amount of structure. 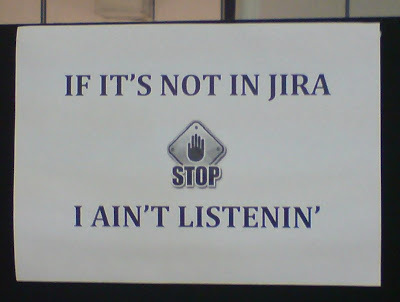 This appeared on the divider between the (recently relocated) programmers and the photography area this lunchtime. The Apache James team have submitted two proposed student projects for Google Summer of Code 2008, you can read them here. 1) Develop a VERP Mailet to allow James to write VERP modified return addresses on outbound messages, and an inbound mailet/matcher to identify VERP bounces and invoke configurable "do something" code. And 2) James' provided mailing list manager is fine for small closed groups, but lacks the functionality of a more robust MLM, the project is to add some all or more of the following features subscriber and message moderation, double opt-in and bounce handling. Spread the word, James needs Students!